Champagne house Moët & Chandon collaborates with DFS in Singapore to launch its limited edition “Tribute to the French Art-de-Vivre” at an exclusive pop-up store in Changi Airport’s Terminal 3. If it seems like travel retail has been getting a lot of the good stuff recently, it’s because it has. Over the past couple of years we’ve seen DFS Group introduce in Changi Airport from the likes of special single cask whiskies from Orkney’s Highland Park to obscenely priced wine collections as part of its eye-boggling annual Masters of Wines & Spirits retail exhibitions, for example. In following that spirit, DFS Group has collaborated with Moët Hennessy to release a limited edition, seasonal Moët & Chandon, the “Tribute to the French Art-de-Vivre”, at a limited time pop-up store in Changi Airport. It’s not a new expression though, but the maison’s signature house style of Moët Impérial in a different livery that depicts various French landmarks such as the iconic Arc de Triomphe, the Eiffel Tower, and Epernay’s Orangerie built by Jean-Remy Moët in the early 1800s. 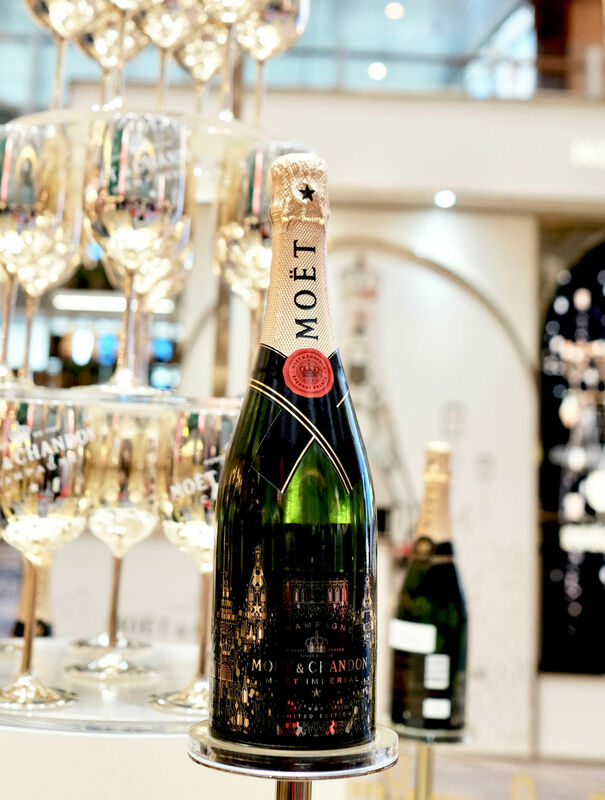 At the pop-up store is also the chance for travelers to personalise their own Moët & Chandon bottles, whether for themselves or as gifts for others that’s perfect for the holiday season. Among the gifting experiences is an automated way to write messages on bottle labels, or to create your own postcards. Complimentary Champagne tastings will also be offered to travelers at appointed times during the day. “Moët & Chandon is famous for the art of generous hosting, the glamour in every detail, the unrivalled savoir- fête and the spirit of grandeur. We partner this holiday season with DFS and Changi Airport Group to enchant travelers through the most iconic symbols of Moët & Chandon and provide them with unique product personalisation experiences,” explains Vanessa Widmann, Moët Hennessy Managing Director Travel Retail Asia Pacific. The Moët & Chandon pop-up store will run from 26 November 2018 to 6 January 2019.